The lateral pterygoid is one of the muscles that controls mandibular position and function. It is one of the muscles that controls the opening and closing paths of the condyles and articular disc complex as well as the protruding/ lateral movements of the mandible. The lateral pterygoid is innervated via the lateral pterygoid nerve of the anterior division of the mandibular branch of the trigeminal nerve (V). The lateral pterygoid muscle, as you are aware, is comprised of two distinct muscle bodies, the superior division (smaller) arising from the infratemporal surface and crest of the greater wing of the sphenoid bone and the inferior division (larger) arising from the lateral surface of the lateral pterygoid plate. Spasm and shortening of the lateral pterygoid can result in losing coordination of the condyle, articular disk and musculature. Clinical experience and observations have confirmed the role of spasm in the lateral head as well as clicking and popping of the TM Joint. The lateral pterygoid is prone to muscular pain and tenderness, resulting in compromised mandibular movements with restrictions when strained and placed in a compromised position. The superior head exerts forward traction on the articular disk during closure of the mandible. This displaces the disk forward and impedes the return of the disk to its normal position, in relation to the condyles as the jaw closes. The superior head is active when the mandible closes but inactive when the mandible opens. The spastic foreshortening of the superior head is the chief suspect in the majority of anteriorly displaced disks (McCarty, 1980). The inferior head of the lateral pterygoid allows for opening of the jaw, protruding of the jaw and lateral movements of the mandible. Significant EMG activity occurs in the inferior head during mandibular opening as referenced in R.E. Moyers, 1950 analysis. The inferior head pulls the condylar head down and forward so the condyle can translate along the posterior surface of the articular eminence when opening wide. Studies have shown both ptergyoid heads function reciprocally during vertical and horizontal jaw movements. Can TENS relax the masticatory muscles of the head and neck region when EMG studies substantiate after TENS relaxation do not monitor the lateral pterygoid muscle? (The skeptics have used this argument for years in opposition to the science of neuromuscular dentistry (NMD) and the debate continues as long as dentists ignore the the neuro-muscular objective measured science and understanding of this exquisite neuro-muscular masticatory system and how it works)! The lateral ptyergoid is a muscle that cannot be easily be measured with surface EMG. The anatomic placement of the muscle behind the ramus makes surface EMG impossible. Since this is the case, one cannot know very easily if the lateral pterygoid is physiologically relaxed with low muscle activity without measuring methods. Needle EMG studies of the lateral pterygoid have been done correlating surface activity of other muscles as reported in the “Masticatory Muscle Function: A Multichannel Electromyographic Investigation”, by Paul Koole a Danish dentist/ researcher. His research is published, very detailed, intense and very thorough. Needle electromyography as utilized in medical neurological testing is employed to test the neural conduction capacity from one point to another. This mode of testing is designed to diagnose neural conductivity. Testing of a single nerve fiber or muscle unit is of no value in the analysis of muscle function/ dysfunction when associated with myogeneous TMD or that which is associated with the analysis of dental occlusion. Hiraba, et. al in his classic needle EMG studies correlated opening, closing and protrusive EMG signaling patterns for both the superior and inferior head of the lateral pterygoid muscle <12>. In contrast, electromyographic techniques using bipolar (paired) silver-silver chloride surface electrodes placed along the long axis of muscles groups provide data related to the collective electrical activity of a large group of muscle fiber units. This is valuable in the muscle activity associated with dental occlusion whether temporomandibular disorders exist or not. 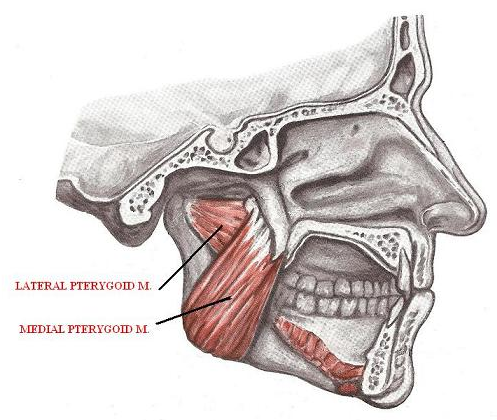 Treacy, reported in his study (1999) page 283, “the pterygoid – masseter muscles are here seen as a unit in accordance with the findings of Hickey, Woelf & Reiner (1957) that suggest an overlapping electrical fields of the lateral pterygoid and masseter when surface EMG is used on the masseter muscle” <1, 2>. The article reported that placing surface EMG electrodes on the masseter muscles will yield information regarding the masseter as well as the pterygoid muscles. One note of interest: If hundreds of universities around the world that have access to TENS, needle EMGs and patients have not published on the correlation of TENS and lateral pterygoid, how can we neuromuscular doctors or manufacturers of computerized electro-diagnostic instrumentation be expected to have done it? Determining a physiologic mandibular position on any patient has given rise to the question of whether to treat from a centric relation or muscularly based position. This challenge results from the lack of convenient procedures to quantify the horizontal mandibular position, which can be determined by a variety of methods <1>. Treatment concepts in dentistry are generally based on a preconceived “normal” state derived from clinical observations and theories rather than scientific objective evidence. Before treatment is rendered, observed physiologic signs and symptoms should be determined if there is presence of any particular pathology. Because of this lack of convenient methods to scientifically verify and record these physiologic muscle characteristics, theories and debates have continued. Drs. Mazzocco and Hickman at the West Virginia University, School of Dentistry, completed a very thorough literature search regarding the lateral pterygoid. They reported, “the literature is generally ambiguous regarding the true role of the ptergyoid complex, however, there does seem to be some concensus that a relaxed masseter will be coincident with a relaxed lateral pterygoid.” They further indicated that they found no sources which reported a method of determining lateral pterygoid status without needle EMG. Without confirming evidence those that theorize have no objective means to directly confirm its status. The needle EMG technique does have its limitations with respect to determining its status at any given point in time, especially when determining an optimal physiologic mandibular position and starting point or treatment. The “bone braced CR” concept has been classically been substantiated by the views that the lateral pterygoid is important in maintaining a CR position to record a hinge axis position as a starting point for diagnosis and treatment. Both the neuromuscular and gnathological camps realize that there is very little written in the scientific literature regarding the lateral pterygoid as it pertains to mandibular positioning and activity. There is much ambiguity regarding this subject. Some advocates in dentistry claim that the lateral pterygoid will only be relaxed if the condyles are seated in a CR position. One question that must be asked is, “In what position in the glenoid fossa is the condyles “seated”? As you are aware, there are seven official “CR” positions and 26 unofficial positions. Depending on what occlusal “camp” one believes depends on one’s view of the precise position. The occlusal definition of CR shows no valid consistency. Even Charles McNeil, Professor of Clinical Dentistry, Department of Restorative Dentistry, Director of the Center of Temporomandibular Disorders and Orofacial Pain, School of Dentistry, University of California, San Francisco, admits in his Quintessence publication and states, “Unfortunately, the definition of centric relation keeps changing in the literature. However, the changes simply relate to improvements in jaw manipulation techniques and new knowledge regarding the antomic and physiologic position of the condyle.” He further states, “Because tomographic surveys of nonsymptomatic subjects have shown great variation in condylar position, this functional definition may be more accurate than the one based on anatomic relationships that cannot be proven”<3>. Mazzacco stated, “The only way to verify muscle activity is via EMG. That is why the EMG guided bite registration is such a break through. By using EMG we are able not only to establish the maximum physiologic opening or closing but coupled with a myotrajectory, we are able to establish a vertical position which represents a balanced A-P muscle position. As long as we are able to return the patient to physiologic rest which we can measure via EMG, then it is possible to identify the physiologic range of motion. This will be consistent because when muscles are at maximum physiologic opening they will be at their maximum physiologic length which is genetically determined for that individual.” Further support is best found in the work of Melvin Moss concerning the functional matrix <9>. Another question that also is raised is, “does one’s approach of evaluation have the ability to discern the activity of the superior belly of the lateral pterygoid … this may not be painful but may create instability as it pulls anteriorly on the disc assembly potentially causing deformation of the posterior bands”. Dr. Gary Wolford a practicing oral maxillo-facial surgeon and expert witness and friend, who treats TMD/ TMJ/ myofacial pain dysfunction cases over the past 16 years, neuromuscularly, and who has also testified in the FDA, ADA hearings, has humbly submitted these points for our understanding and review. The articular disc cannot not be displaced from the condylar head if the discal ligaments are intact and functional. The lateral and medial discal ligaments attach the disc tightly to the condylar head. If the lateral discal ligament is torn, the superior head of the lateral pterygoid will position the disc anterior-medially and there will be a reciprocal click on opening and closing with the opening click at a greater incisal opening click. (This is confirmed with objective sonographic (ESG) recordings of the TM Joints as well as first had observations on numerous surgical cases). The same clinical and anatomical findings will be present if both the medial and lateral discal ligaments are torn. Additionally, in both #2 and 3 axially corrected tomograms will show posterior/ posterior superior positioning of the condyles in the fossa in maximum occlusion. If the medial discal ligament is torn alone – very rare – the disc will be laterally displaced in maximum occlusion. The patient will still have reciprocal click. The posterior ligamentous attachment of the bilaminar zone is never torn in clinical conditions. The bilaminar zone will tear before the posterior ligament. I have never seen the posterior ligament torn in over 1000 joint surgeries – most of which were performed prior to 1974. The superior head of the lateral pterygoid can only pull disc forward if the lateral or medial discal ligaments are torn – I do not believe that the muscle alone can tear the discal ligaments if the condyles are centered in the fossa and the patient’s closure trajectory is the same as the myotrajectory. Pulsing with the Myomonitor will “let” the mandible position anteriorly and inferiorly because of the relaxation of the temporalis muscle- particularly the posterior temporalis – because the posterior temporalis is the only muscle that exerts posterior traction on the mandible. Relax the posterior temporalis and the mandible will position anteriorly and downward in the fossa. Patients with myfacial pain – noninfectious – will all close posterior to the myotrajectory. Relax the muscles with the Myomonitor and the mandible will position anteriorly and inferiorly. This is verified with computerized mandibular scanning (Jaw tracking instrumentation), Scan 5. Any manual manipulation of the mandible overrides the physiological neuromuscular function of the elevator muscles. If the discal ligaments are torn, manual manipulation will produce a closing pathway with the disc positioned anteriorly to the condyle. Note: These above points are from an oral surgeon and not from a gnathologically trained dentist. These observations are the result of 16 years of experience with the Myotronics instrumentation and with the goal to eliminate unnecessary joint surgery. Studies document the J5 Myomonitor TENS (Myotronics, Inc.) stimulation of the Vth and VIIth cranial nerves through neural mediation. Stimulation and relaxation of lateral pterygoid by the Myomonitor pulse is inevitable since neural mediation by definition stimulates all muscles innervated by the Vth and VIIth cranial nerves including the lateral pterygoid. The term transcutaneous electrical neural stimulation (TENS) describes two distinct types of medical devices. One is the high frequency, low amperage type of stimulation and the other is a low voltage, low frequency stimulator. High frequency, low amperage TENS is a pain suppressor instrument. Its therapeutic effect, according to the “Gate Theory” of Melzack and Wall, is to block the afferent pain pathways to the central nervous system to flooding the system with a barrage of innoculous low level stimuli. Low frequency, low amperage TENS on the other hand effects a relaxation of the masticatory muscles <4-6>. Providing a pumping intermittent stimulation of the nerve innervating the masticatory muscles, the muscles are debrided of waste metabolites (including ADP and lactic acid), circulation is improved with re-stocking of fresh metabolites (ATP), endorphins are released systemically, and muscle contraction released. This is accompanied by neurologically mediated pain relief and further muscles relaxation <7>. The specific TENS instrument, Myomonitor (Myotronics-Noromed, Inc.) delivers a repetitive stimulus of 8 to 12 mA for 500 microseconds once every 1.5 seconds. It is applied bilaterally to the area between the temporomandibular joints and the coronoid process of the mandible. A third grounding electrode is placed on the rear of the neck and does not deliver stimulus. Placement of the bilateral active electrodes is critical, for only at that position is the mandibular division of the trigeminal nerve (V) accessible form the surface of the face. The nerve is located deep to the mandible, but accessible via surface application of the subtle stimulus through the soft tissues <8>. In addition to stimulation of the division of the Vth nerve, the facial nerve (VII), which traverses the same area superficially, is also stimulated. Through this neural route of stimulation, all of the facial and masticatory muscles are stimulated simultaneously. Mandibular Nerve V- masseter, temporalis, medial pterygoid, lateral pterygoid, tensor veli palatini, mylohyoid, anterior belly of digastric. Facial Nerve VII – Muscles of the nose, buccinator, rhisorius, obbicularis oris, muscles of lower lip and chin, platysma, posterior belly of digastric. Choi and Mitani document that the stimulus from the Myomonitor TENS is neurally mediated. All muscles of mastication are pulsed by the stimulus and muscle relaxation is verified by sEMG recordings. The stimulus is not selective, but in fact affects all muscles of mastication including the lateral pterygoids <13>. During surgery he would stimulate muscles. Oral surgeon would give succinylcholine that would block the stimulus – myo-monitor TEN stimulus was blocked by succinylcholine. Oral surgeon then gave Nyloxone which would reverse reaction thus allowing stimulus to continue <11>. Reference: Williamson, E and Marshall, D: Myomonitor rest position in the presence and absence of stress, J Facial Orthopedics and Temporomandibular Arthrography, editor Williamson, Vol. 3, No. 2, 1986. TENS stimulates the superior and inferior head of LP’s in synch. THIS IS NOT PHYSIOLOGIC. Because the inferior head is working during TENS it actually projects the jaw forward. Superior head is switched off when PROTRUDING the mandible forward (Hiraba, et al). By advancing the mandible in the Chan Optimized Bite™ protocol you balance out the effect of the upper and lower heads to derive a more physiologic position. You inhibit the involuntary contraction of the superior head of the LP muscle. Inferior head as it is brought forward (Chan Optimized Bite protocol using K7 and simultaneous TENS) is being activated while the superior is being inactivated at the proper physiologic balance. This can only be seen and observed using Myotronics K7 Jaw tracking instrumentation following the protocols as taught at Occlusion Connections Levels 1-7 courses. The superior head during jaw closure decreases vertical, increases antero-posterior position of the mandible. Each myo-pulse produces an activation of the superior head (jaw closure response) while the inferior head (jaw opening response) deactivates, relaxes. When the jaw protrudes EMG activity of the superior head diminishes/quiets. Synchronously, the inferior head EMG activates (increasing vertical, increasing AP movement of the mandible). When the masticatory muscles are TENSed the superior head begins to relax allowing both antagonists with gravity to assist in mandibular repositioning in a down and forward direction from the existing habitual bite and the condyles decompress. This is just a beginning thought into some of the hidden GNM secrets what Dr. Clayton Chan has discovered and pioneered in his clinical practice and with his OC teachings. This is just a glimpse in to the scientific arena of what is recognized as Bite Optimization. One can measure the muscle responses via EMG recordings that are affected by the trigeminal nerve which includes the anterior temporalis, masseter, the digastric and the posterior temporalis. The anatomic placement of the lateral pterygoid muscle behind the ramus makes surface EMG impossible. It can be anatomically and neuro-physiologically concluded, that the lateral pterygoid can also receive the same muscle response since it also is innervated by the same fifth cranial nerve, the trigeminal (V). Therefore the muscle response such as the temporalis anterior, masseter, the anterior belly of the digastric and the posterior temporalis, which are also supplied by the same mandibular division of the fifth nerve, the trigeminal, can be extrapolated into useful clinical information about the isolated lateral pterygoid muscle. Fuji and Mitani (Fuji, H and Mitani, H. : Reflex Response of the Masseter and Temporal Muscles in Man, J. Dent. Res. 52:1046, 1050, 1973) <9> as well as other studies have show that the Myomonitor (TENS) electrodes placed over the mandibular notch stimulates the Vth and the VIIth cranial nerves through neural mediation <7>. Stimulation of the lateral pterygoid by the Myomonitor or pulse is inevitable if these studies are accepted as proof of neural mediation of the Myomonitor stimulation. There are numerous studies that have confirmed the validity and science supporting these neuro-physiologic findings. The scientific regulatory boards of the ADA and FDA have reviewed and confirmed these facts during the Dental Products Advisory Panels review in 1994. When muscles are innervated by the fifth cranial nerve, including the lateral pterygoid, are physiologically rested via the use of the TENS and monitored using surface EMG the muscles of mastication can be effectively relaxed allowing the mandible to position to a physiologic down and forward position. This is very different than what has been taught by traditional teachings of the condyles in a habitually strained up and back position. One of the reasons that the criticism has been interestingly focused to that of the lateral pterygoid muscle is that they claim this muscle cannot be measured with surface electromyography (EMG) instrumentation. Although their statement is partially true, they fail to understand what surface EMG aims to accomplish when applied to monitoring muscle activity and mandibular position. An understanding of the neural pathways that innervate the muscle of mastication is also needed to fully comprehend the rationale for using surface electromyography. By using electromyographic instrumentation we can prove physiologic rested mandibular to maxillary relationship. Using surface EMG has been well established in the medical and dental literature for determining muscle hyperactive as well as muscle rest, function and comfort. An understanding of which muscles are innervated by the trigeminal nerve (V) and the facial nerve (VII) is paramount to appreciate this technology. 1980, chap. 8, p. 145.
muscles involved in temporomandibular movement. Am J Ortho, 36:481-515, 1950. EuroAmerica, Inc. Publishers, St. Louis, Missouri, 1990. McNamara, J.A. : The independent functions of the two heads of the lateral pterygoid muscle. Am. J. Anat., 138:197-206, 1973. Travell, J. G.: Myofascial Pain and Dysfunction The Trigger Point Manual The Upper Extremities, Williams & Wilkins, Baltimore, MD, Volume 1, pp. 174-179. Koole, P.: An electromyographic investigation of the function of the human lateral ptergygoid muscle in relation to the activity of other masticatory muscles in Masticatory Muscle Function: A Multichannel Electrmyographic Investigation RIJKSUNIVERSITEIT GRONINGEN 1998 ISBN:90-367-0917-2. Jankelson, B., Sparks, S., and Crane, P., Neural conduction of the Myo-monitor stimulus: A quantitative analysis. J. Prosthetic Dentistry. Vol. 34, No. 3, pp 245-253, September 1975. Fujii, H. Evoked EMG of masseter and temporalis muscles in man. J. of Oral Rehabilitation. Vol. 4 pp 291-303, 1977. Fujii, H., and Mitani, H. Reflex responses of the masseter and temporal muscles in man. J. of Dental Research. Vol. 52, No. 5, pp. 1046-1050, 1973. Choi, B. On the mandibular position regulated by Myo-monitor stimulation. J. Japanese Prosthetic Dentistry. Vol. 17 pp 73-96, 1973. Williamson, E., and Marshall, D. Myomonitor rest position in the presence and absence of stress. Facial Orthopedics and Temporomandibular Arthrography. Ed. Williamson, Vol. 3, No: 2, 1986. Hiraba K1, Hibino K, Hiranuma K, Negoro T: EMG activities of two heads of the human lateral pterygoid muscle in relation to mandibular condyle movement and biting force. J Neurophysiol. 2000 Apr;83(4):2120-37. Choi, B.B., Mitani, H.: On the mandibular position regulated by the Myomonitor. J Jap Prosth Soc. 17:79, 1973. There is a study by Paul Koole, a Danish dentist/researcher, that correlates the emg’s of the lateral pterygoid through needle placement with the surface activity of the other muscles of mastication. This study proves that surface TENSing causes relaxation of the lateral pterygoid (Masticatory Muscle Function: A Multichannel Electromyographic Investigation).